Murshidabad, which was initially known as Maksudabad, is one of the biggest tourist spots in West Bengal known for its historical importance that has seen some of the famous Nawabs as the rulers of the place. Nawab Murshid Quli Khan, who was the Diwan of Bengal under the rule of Mughal Emperor Aurangzeb, shifted the capital to Maksudabad from Dhaka and renamed the place as Murshidabad. Visitors can travel to Murshidabad either by cab or train. The nearest airport is Netaji Subhas Chandra Bose Airport situated in Kolkata. 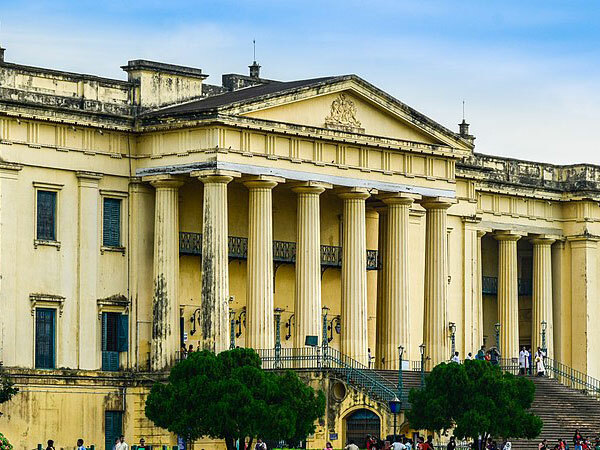 Built in 1837, Hazarduari Palace is one of the most popular tourist attractions in Murshidabad. The magnificent palace, which got its name for having a thousand doors, was constructed following the European style of architecture. Apart from the thousand doors, Hazarduari Palace also features 114 rooms and 8 galleries. The three-storey palace has now been converted into a museum which showcases a wide collection of paintings, several portraits of the Nawabs of Murshidabad, armoury used by the Nawabs and various other interesting things from the past. The Nizamat Imambara is located quite close to the royal Hazarduari Palace. In 1847 AD, Nawab Nazim Mansoor Ali Khan Feradun Jah built the Imambara after the Siraj-ud-Daulla's Imambara was destroyed by a fire. This is the largest Imambara in West Bengal. Nawab Wasif Ali Mirza Khan built the Wasif Manzil but a huge part of the palace was destroyed in an earthquake in the year 1897. Later, the palace was repaired but the second storey was never constructed again. Located near the Hazarduari Palace, the Wasif Manzil also had an artificial hill and a garden close to the main palace, but those don't exist any more. The palace is quite small in size, but it is as beautiful as any other royal palace. Moti Jheel is a beautiful horseshoe-shaped lake that was excavated by the famous Ghaseti Begum's husband, Nawazesh Mohammad. According to history, British high-ranking officials such as Warren Hastings, Sir John Shore, Lord Teignmouth and several others had their residence at Moti Jheel. This place was also popularly known as Company Bagh. In 1723, Katra Mosque was built by Nawab Murshid Quli Khan and is one of the oldest mosques in West Bengal. This place is another popular tourist spot as Nawab Murshid Quli Khan is regarded as an important figure in the history of Murshidabad. It is said that the town of Murshidabad got its name from this Nawab. The double-storeyed mosque is raised on a platform with a number of domes and four tall octagonal minarets, out of which two were destroyed. These minarets were used to keep weapons in the ancient days. Katra Mosque, which is now maintained by the Archaeological Survey of India, is so big that it can easily accommodate 2000 people inside the prayer hall. Visitors can also have a look at the tomb of Nawab Murshid Quli Khan located at the entrance of the Katra Mosque. The Nasirpur Palace was constructed by the descendants of Debi Singh, who was a tax collector during the era of the East India Company. The palace features a temple of Lord Lakshmi-Narayana and a Ramachandra Temple, which is said to be one of the biggest temples in the district of Murshidabad. Meanwhile, the Lakshmi-Narayana Temple is also popular for the Jhulan Yatra celebrations in March. Situated beside the Bhagirathi river in Murshidabad, the Kathgola Palace is one of the major tourist attractions in the town. The palace along with the gardens was built to entertain the Muslim and European merchants when they came on their trade visits. It is said that black roses were found in the Kathgola Gardens in the past. Janardan Karmakar, a craftsman from Dhaka, built a large canon which was named Jahan Kosha. The name of the canon means the destroyer of the world. The canon, which weighs 16,880 lb and is 17.5 ft in length, is located at a distance of only 1 km from Katra. Apart from the canon, tourists can also take a tour of Kadam Shari's mosque constructed next to Jahan Kosha. The mosque reportedly features the replica of prophet Hazrat Muhammad's footprint. Jafarganj Cemetery, which is located near the Hazarduari Palace, serves as the cemetery for the famous Mir Jafar and a number of his family members such as his father, Syud Ahmed Nazafi, sister and two of his widows. Initially, the place was known as Jafarganj Complex and Mir Jafar had built his palace there. The government of West Bengal initiated the construction of the museum in 1965-66, but it took almost 20 years to complete the museum. It is said that Late Rai Bahadur Surendra Narayan Singha of Jiaganj played a major role in establishing the museum. The Murshidabad District Museum showcases a number of sculptures, manuscripts, books and some of the late Rai Bahadur Surendra Narayan Singha's personal collections. Photography is not allowed inside the museum premises.